Planting a new lawn can be a daunting task because of the time and commitment it involves. Planting grass seed is the most inexpensive way to plant a new lawn, but also the most time-consuming. 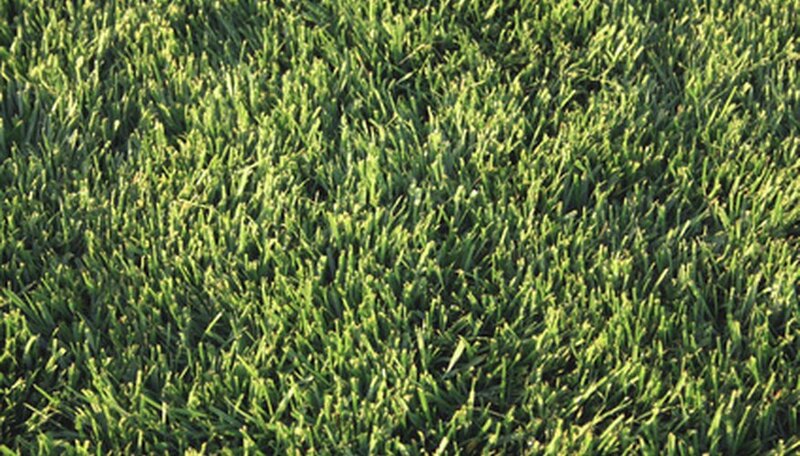 It can take more than a month for grass seed to grow into a healthy lawn. However, using grass seed gives you more options than sod, and the end result is often a more hardy and durable lawn, according to All About Lawns. Fertilizing the soil before laying seed helps ensure your lawn will grow in healthy and green. Till the soil where grass is to be planted to a depth of 4 inches to 6 inches. It's best to till soil when it is dry, according to the Iowa State University Extension. Fertilize the soil with a starter fertilizer to prepare it for planting. Use a high-phosphorus fertilizer such as a 1-2-1, and apply it only to the top level of soil. Rake the soil lightly to remove debris and loosen it so the seed can become embedded. Spread the grass seed either by hand or using a hand caster or seed spreader, which can ensure even distribution of the seed. Check the seed label directions for the appropriate seed rate. Roll the lawn area with a lawn roller half-filled with water. This will push the seed firmly into the soil, ensuring the contact necessary for it to germinate. Water the area immediately after planting. Use only as much water as is necessary to keep the soil moist, according to the Iowa State University Extension. Proper watering is important for three to four weeks following seeding. In many areas, you may have to water the soil surface daily or even two to three times a day to keep it from drying out. Spread straw over the seed, using one bale for every 1,000 square feet of yard space, according to the Iowa State University Extension. The straw will help prevent the seed from blowing away and help the soil conserve moisture. When spreading grass seed, divide it in half. Spread the first half while walking in one direction, such as north to south, and the second half while walking in the opposite direction, such as east to west, according to the Iowa State University Extension. This will help ensure thorough and even coverage. Mow your new lawn when the blades are between 3 and 3 1/2 inches tall, according to the Iowa State University Extension. Never remove more than 1/3 of the blade height in a single mowing. If your live in a high-traffic area, consider installing stakes strung with string or tape to keep people and animals off your yard until the grass grows in. Do not use starter fertilizers with weed-control chemicals because they could interfere with grass growth, according to All About Lawns. Do not plant grass seed on a windy day. The seed could be blown from the soil, resulting in spotty grass coverage.